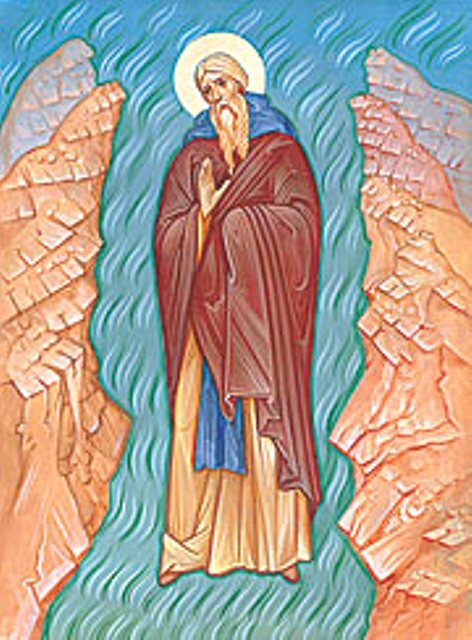 Saint Bessarion, Wonderworker of Egypt was an Egyptian. He was baptized while still in his youth, and he led a strict life, striving to preserve the grace given him during Baptism. Seeking to become more closely acquainted with the monastic life, he journeyed to the holy places. He was in Jerusalem, he visited Saint Gerasimus (March 4) in the Jordanian wilderness, he viewed other desert monasteries, and assimilated all the rules of monastic life. Upon his return, he received monastic tonsure and became a disciple of Saint Isidore of Pelusium (February 4). Saint Bessarion took a vow of silence, and partook of food only once a week. Sometimes he remained without food or drink for forty days. Once, the saint stood motionless for forty days and forty nights without food or sleep, immersed in prayer. Saint Bessarion received from God the gift of wonderworking. When his disciple was very thirsty, he sweetened bitter water. By his prayer the Lord sent rain upon the earth, and he could cross a river as if on dry land. With a single word he cast out devils, but he did this privately to avoid glory. His humility was so great that once, when a priest ordered someone from the skete to leave church for having fallen into sin, Bessarion also went with him saying, “I am a sinner, too.” Saint Bessarion slept only while standing or sitting. A large portion of his life was spent under the open sky in prayerful solitude. He peacefully departed to the Lord in his old age. O God of our Fathers, / Always act with kindness towards us; / take not Your mercy from us, / but guide our lives in peace / through the prayers of the venerable Bessarion and Hilarion the New. You imitated the powers on high, venerable Bessarion, / living by example the life of those who take flight. / Led by steadfast desire to the heavenly good things of Christ the King, / you put passing things from your mind and attained to Him. / Entreat Him without ceasing for the sake of us all!